Bill Hayden, Governor-General of Australia, is on record as saying: "We're an anomaly as a European country in this part of the world...It is inevitable in my view that Australia will become a Eurasian country over the next century or two. I happen to think that's desirable. This means we are becoming part of the mainstream of this region". Although many Australians may dispute Bill Hayden's vision of the future, few, if any, can ignore it. "Australia's Immigrants", extensively revised, is a one-volume account of the dynamic part migration has played in the formation of Australian society. As Australia enters the third century of European settlement, it is becoming increasingly important to understand how past and present arrivals of people and cultures both create and transform the social and economic fabric of Australian society. 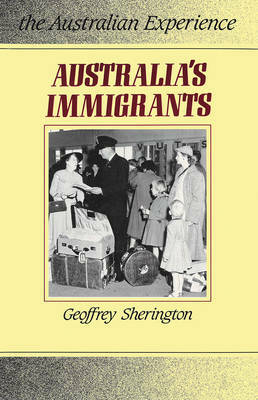 In this new edition, Geoffrey Sherington uses the latest research findings to supplement his two-century survey and to take account of recent changes both to actual immigration and to immigration policy which have brought Australians much closer to a realization of their place within the Asia-Pacific region. "Based on solid research, excellently readable and thought provoking." - "The History Teacher" "Brief, unpretentious and the sources are used skilfully ...a considerable volume of useful information is marshalled and effectively ordered." - "Australian Journal of Politics and History" Geoffrey Sherington is Associate Professor in the Faculty of Education at the University of Sydney. His interests include both the study of immigration and the history of education. This book is intended for students and researchers in Australian history and studies.